Speaking of new attitude Hansel! is the right one to show it! With this EP we go trough the genres and redefine them in our way. From Techno to House from Romanian to Chicago you name it! We deliver our best and for Divers EP we chosen Cosmjn to remix the “Groobox” track and his interpretation reveals more dreams that we could dream of. We are very happy to have Cosmjn on board, we really love his passion for music! Because we choose to concentrate more on the artist now we put out more original ideas and Hansel! really completes the EP with the “Maine” track, a track from tomorrow, a track with a sound that we would look over in the time to come. Enjoy our new EP from Hansel! with Cosmjn remix, from Tzinah with Love! Hansel! – Divers EP [TZH058] incl Cosmjn is supported by Richie Hawtin, Marco Carola, Raresh, Bill Patrick, Andrew Grant, Livio & Roby, Cesar Merveille, Gel Abril, Paco Osuna, Nico Lahs, Matthew Dekay, Negru, Patrice Meiner, Randall M, Julie Marghilano, Oshana, Re-UP, Francisco Allendes, Joseph Capriati, Superlounge, Evren Ulusoy, Chad Andrew, Robert Powlson, Carlos Sanchez, Archie Hamilton, Deltano, Chaim, Jessica Diaz, Camiel Daamen, Deaf Pillow, Luc Ringeisen, Hermanez, Alex Piccini, Jorge Savoretti, Superlounge, Javier Carballo, Edgar De Ramon, Julie Marghilano, Hanfry Martinez, Maceo Plex / Maetrik, Omar Salgado, Faster, Jun Akimoto, Seb Zito and many more! Thank you! Raresh: nice tracks ! will play some out :) multumesc ! 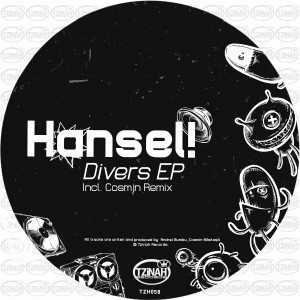 Livio & Roby (Roby): Nice release from Hansel! Thanks! Cesar Merveille: good stuff thanks! Gel Abril: will play all tnx! Nico Lahs: nice ep support. Matthew Dekay: Hansel! nice! will try some out this weekend. thanks Tzinah! Joseph Capriati: Downloaded for Joseph Capriati, thanks. Superlounge: Thank you for the music! Evren Ulusoy: cool ep here. maine is my fav. thanks. Chad Andrew: Nice tracks here! Camiel Daamen: Groobox for me! Hermanez: Amazing music, will play the originals ! Alex Piccini: Nice Release ! Superlounge: Nice! Thank you for the music! Javier Carballo: high quality as usual, im big fan of Hansel! Edgar De Ramon: Downloadinng to try it out, THanks!! Maceo Plex / Maetrik: downloaded for maceo plex / maetrik, thanks for the music! Faster: Groobox for me! Thanks! Seb Zito: Great ep will test these out for sure. Jay West: will check, thanks! Loopdeville: Hansel is a personal fav of mine!Thanks! Varoslav: some nice tool trcks to play ! looks my fav is comijn rmx . Jason Hodges: Point Of View is dope!! Clara Da Costa: Great release. loving Maine. Will support on Jacks House, Ibiza Sonica Radio. Chase B:wicked ep point of View is my fav. Olderic: nice ep, into it, thanks! Edground: Nice tracks. Will play. Jozhy K: Point of view, Maine for me! Very nice tunes! Blagoj Rambabov/Podime: All around perfect, thanks! Adrianho: Nice ep, will try all thanks ! Claudia Amprimo: nice ep thanks for the music! GIACOMO GREPPI: Very Nice!!! Groobox For Me !!! Full Support !!! Nina Soul: Amazing ep, will play, thanks! Scan Mode: awesome release! will play and support for sure! Boronas / Square Room Heroes: great deep chordy style..both groobox are amazing.! Farfan: support, nice ep ! Zotist: Good Release! all trax rox! thx! Lex (Athens): great pack.. thanks!! Chris DB: Hansel originals are always great . Thanks ! Gik: Thank you for the music. `Maine` sound rellay cool, nice ep again. Miroslav Petkovic: Everytime I know what to expect from Tzinah, however I get suprised all the time. Love the release! Adam Touch: Hansel! did a really great work here, can’t choose my favorite one! Thanks for sending, will try for sure! FLMB Crew: Will try it for sure! Peace! Apua: Thx for the music ! Groobox is a killer! Martin Dacar: this is so nice!! Dee Bufato: I really like “Point of View”. Thanks for sending. Bolumar (Amam/Rooted): Nice pack! will play for sure!! Thanks for sharing! Just_Me: very nice tracks in here, supporting! Nova Caza: Great deep release again from one of the best underground labels right now ! Lets go for the next 5 years ! Alex Kravitz: Nice ep, thanks! Dimitri Monev: Maine is my fav and Cosmjn is cool one too , thx !! Jamie Lie A Kwie: Thanks for the promo! Quality stuff as always. Point of view and Maine are my favorites :) Always support for Tzinah! Olivian Nour: Cool release. Thanks! Uno Taman:Solid EP. Thanks for the music. Alex Highman: Thanks! Hard to pick a favorite. Much love! Zetqa: Love Groovbox original and the remix ! support! Motoko: Point of view and Cosmjn remix for me. Nice a fresh for the Summer. Dejvid: Hansel always quality stuff! Katoline: Perfect for me ! Big support for all tracks! Ocu:Very nice from Hansel! Maine & Groobox 4 me!! Holchin: Hansel! always good! ;) nice ep… thank you!!!! Maertz: Really nice release. Good originals and remixes, I will play for sure. Thanks so much for sending. Franco y Gael: nice EP !! thanks !! !